When Petrolia Energy began in 2012, we started with a singular focus, to acquire and develop new prospects in oil rich Texas. Over the last few years, we have evolved into a more dynamic enterprise and have earned the respect of the industry as an experienced, capable and cost-effective operator. With the integration of new technology in the Energy sector, we have been able to find opportunity in re-engineering of resource-in-place assets. in well established Oil & Gas regions of the United States. Since then, We have established a clearly defined strategy to acquire, enhance and develop high-quality, resource-in-place assets. 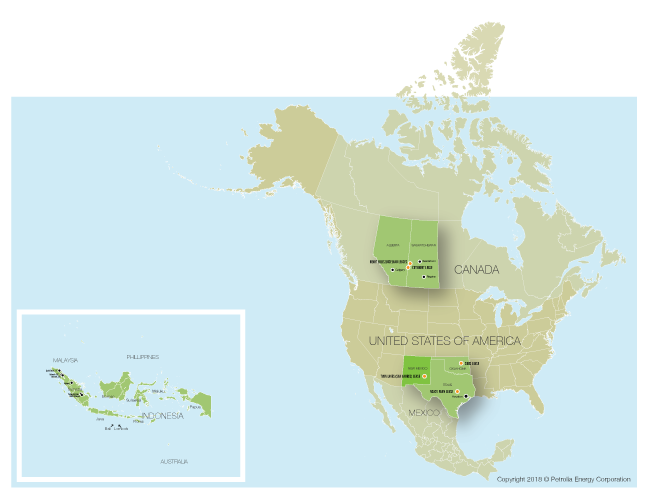 We’ve focused our acquisition efforts in well established Oil & Gas regions of the United States, including the Permian Basin and have recently expanded our ownership interests outside the United States. With recent acquisitions in Canada and Indonesia we continue to grow our production base, in such plays as the significant producing formations like the Bakken play. With a clearly defined strategy to acquire, enhance and strong focus on acquiring high-quality, resource-in-play assets.